I heard on GMA yesterday that the average U.S. household throws out nearly a quarter of the fruits and vegetables it buys. For a family of four, that adds up to about $500 each year, according to a study by the University of Arizona. Read the rest of the story to learn how to store your food to keep it fresher and make it last longer. RecipeMatcher looks like a handy site to help you use the foods you have so they don't go to waste. Occasionally I might throw something out, but I don't think it's nearly a quarter of my produce. Maybe it's because I cook this way on a regular basis - planning meals around whatever's in the refrigerator that needs to be used. I think it's important to use what you have. Otherwise, you're just wasting money. Check your refrigerator and pantry, visit Recipe Matcher, and start typing in the ingredients you have on hand that need to be used. You can also choose the type of recipe you want and what your main ingredient should be, and then search to find recipes using the ingredients you have. You'll get a whole list of recipes to choose from. 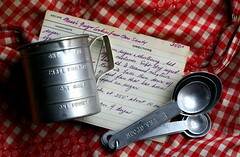 Each recipe lets you know how long it takes to prepare as well as the other ingredients you'll need. It looks like anyone can search and find recipes, but signing up for a free account lets you leave comments, keep an online pantry, make and print shopping lists, keep lists of your favorite recipes, and even submit your own, so I signed up. I'm guessing that once I stock my online pantry by checking off all the items I have in my refrigerator, freezer, and pantry, the recipes will fit my needs even better, because the site will be able to suggest recipes I have all the ingredients for. In a very large skillet (12-inch), sauté onion, peppers, garlic and ground beef until beef is browned. Drain excess fat. Add salsa, chili beans, tomatoes, cumin and pepper. Heat thoroughly. Place approximately 1/4 cup meat mixture in center of a tortilla. Sprinkle with 1 Tbsp. cheese. Bring edges of tortilla together, overlapping slightly to enclose filling. Place, seam side down, in 13" x 9" baking dish. Repeat with remaining tortillas. You will have 8 enchiladas from one end of the dish to the other, then the remaining 2 turned along the edge. Spoon remaining meat sauce over tortillas. Spoon sour cream down center of dish. Sprinkle with remaining cheese. Bake at 350° for about 30 minutes. Sprinkle with green onions and serve. I've been making this for quite a while now. As with anything like this, the ingredients aren't set in stone. Don't have a red pepper? Use two green, or 1-1/2, or even one. Use more onion. Use a different kind of beans. Use taco sauce instead of salsa. It's up to you. 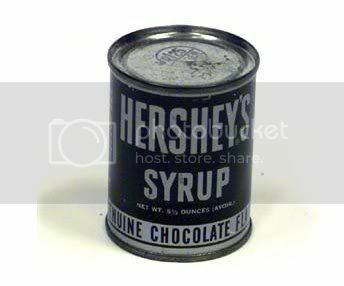 We used to buy our Hershey's chocolate syrup in the can. When the can got about empty, we opened the top of the can and used a spatula to scrape out every last bit of the chocolate. I mean, it is chocolate, and it's not good to waste chocolate. Now we buy our Hershey's syrup in the bottle, and it took me a while to figure out how to get every last bit of chocolate from that bottle. It's not like you can open up the bottle and scrape the chocolate out. Instead, we have to make chocolate milk: Unscrew the top, pour some milk into the bottle, shake it up well, pour into a glass, and enjoy.